Bright Neon OPEN Sign Visible day and night! 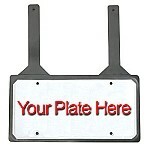 This Bright Neon red and blue sign is eye catching and features a long 10 foot cord and 40 watt output. Hanging Chains included. 50/60 Hz input. UL Listed. Sign is 23 1/2" W x 3 1/2" D x 10 1/2" H.